With sadness we announce the passing of Margaret Adella Phillips (nee Burch), wife of the late John Harold Phillips on Wednesday, July 18, 2018. Margaret was born June 23, 1922 on the family farm in the municipality of North Cypress, north of Carberry, Manitoba, the youngest child of Samuel Edward Burch and Agnes Mabel (nee Mann). 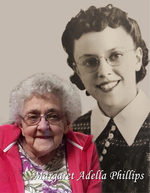 She passed away at Rest Haven Nursing Home in Steinbach, MB, at 96 years of age. Margaret is survived by her 5 children: Floyd (Sandra), Velma Perry (David), Wanda Waldner (Moses), Rheta White (Reid), Murray (Pam); grandchildren: Kirk, Lori (Chris), Robyn (Dan), John (Wendy), Susan (Björn), Nathan (Emilie), Shandee (Gavin), Ladonna (Justin), Wesley (Jennie), Jaime (Jennifer), Scott (Sarah), Christine, Michael, Lance (Jasmine), Ryan (Elena); and 18 great-grandchildren; brothers Barrie and Bill; and sister-in-law Rena Cornish. She was predeceased by her husband, John, in 2015; her parents; brothers Delmar and Cecil; sister Eva (Phillips); and her granddaughter Laura Perry. Margaret grew up on the Burch family farm. She enjoyed the outside chores; gardening and taking care of the chickens and farm animals. She attended school in Wellwood and Carberry and graduated from Normal School in Brandon in 1941. She began her teaching career in one-room schools, first in Summerville and ending at Glanton School in 1946. She gave up a full-time teaching career to raise a family and work as a farm wife. She never gave up teaching entirely; doing some home schooling, substitute teaching, tutoring, teaching music and teaching Sunday School. Margaret and John were married on January 16, 1946 shortly after he returned from serving overseas in WWII. They bought the Phillips family farm in Elton Municipality where their farming partnership lasted until 2010. Margaret was involved in all aspects of the farm. She could be found milking cows, tending poultry (including chickens, hens, turkeys, ducks, and geese), gardening, selling eggs for grocery money, driving to town for machinery parts and driving the truck for harvesting; always singing around the house. She was also a good cook with bread, buns, and pies being her specialty. In between farm duties, she found time to sew everything from tailored jackets to wedding dresses. She also enjoyed embroidery and other hand crafts and, in later years, spent many hours on Word Searches. When John’s health began to fail, they left the farm and moved to Brandon in 2010. In 2013, she and John moved to Rest Haven Nursing Home in Steinbach where they could be together and also near their daughter, Wanda. One of her joys at Rest Haven was her little flower plot on the patio which she visited almost daily in the summer. Margaret’s life was a life of service. She served as a pianist at church, as leader of women’s ministries and as a Sunday School teacher for many years. She was always willing to listen to a troubled friend, and was generous with her time, garden produce and eggs for those in need. She also loved to talk on the phone, which in later years became her lifeline to keep in touch with her family and her many friends. We will miss those phone calls and her cheerful updates and reminders. She believed in the power of God through prayer and she would often encourage us to pray for someone who was ill or in some hardship. Her prayers continued right up to the end of her life. We rejoice in a life well-lived and celebrate Margaret’s life saying thanks to God for her influence in our lives. We also want to express our thanks and appreciation for the staff at Rest Haven who took such good care of Margaret. Their patience and compassion went far above the call of duty. The Ceremony to Celebrate Margaret's Life took place at Memories Chapel on Saturday, July 28, 2018. Pastor Len Smith officiated. Interment followed at the Brandon Cemetery. Flowers are gratefully declined. Donations in memory of Margaret may be made to HavenGroup Foundation, 177 Woodhaven Avenue, Steinbach, MB R5G 1K7.